This is a quick update on the “I Can Do It” Gent’s Tool Chest that I covered in an earlier post. I decided to add the faux raised panel. Honestly that was the most fun of the whole project. I didn’t even stop and take pictures of the process. I took one of these cheesy 1-by pine boards and sawed out a slightly oversize piece for the panel. I planed one side so it was flat, trued one edge, flipped it over and took it down to 1/2″ with a scrub plane, then flattened it with a #6. Wow, it went fast and came out pretty nice. I shot one end square, trimmed and shot it to length and planed the last long side to width. Then I beveled the edges with a low angle block plane. I did the ends first in case going across the grain caused any blow outs (it did, but not bad) then did the long edges. 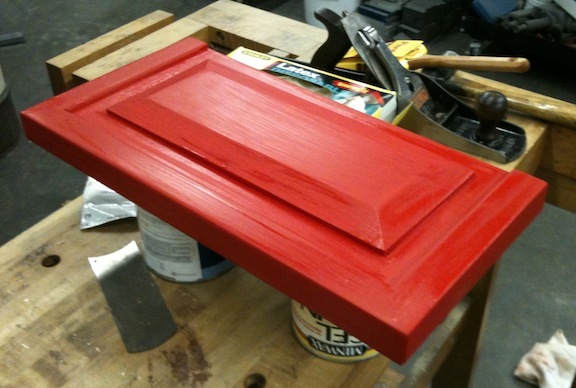 I glued it to the lid of the box and sanded everything with 220. Honestly I should have left the raised panel unsanded. Sanding immediately rounded over the nice crisp edges I had from planing the bevels even though I used a light touch and a sanding block. 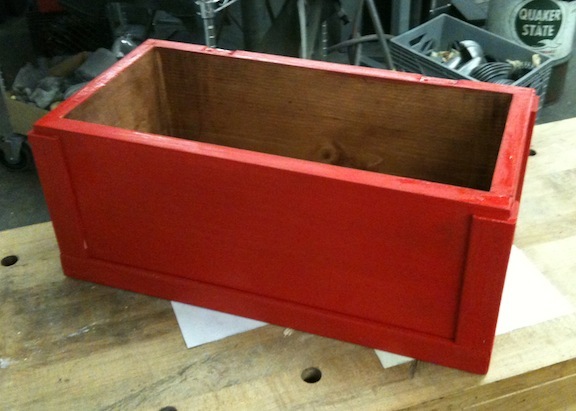 I stained the inside of the box and lid, and painted one coat of red latex on the outside. When that has dried I’ll put a coat of black over the red and then selectively sand through the black to expose the red and the pine to give it some character. Paint really helped the appearance.